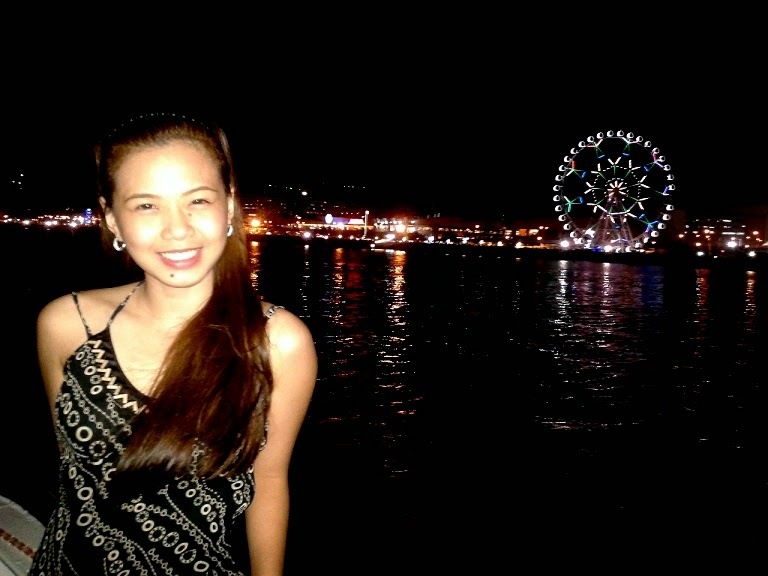 I have always wanted (but never tried) to have the Manila Bay sunset cruise. I've already tried the river cruise of Bohol, Bangkok, Thailand, Yangon, Myanmar and Ho Chi Minh, Vietnam but I have never tried the Manila Bay cruise. And finally, after the long wait, I was given the chance last May 19, 2014. They say that having the yacht dinner cruise is a lot better. But for the meantime, this Manila Bay cruise would suffice. With my friend, Genine Alyssa Pedreno, we experienced this cruise two days prior to her departure to Dubai where she will join her family for good. The dinner was some sort of thanksgiving dinner for all her work for my travel, tour and hotel bookings both local and abroad. Passengers must check-in 15 minutes before departure time for passenger manifest inclusion. Passengers who arrive after the cut-off time will not be allowed to go on board. The best time to have the dinner is 6:15 pm so that you can witness both the sunset and the Manila skyline. Once you are onboard the vessel and cruising the Manila Bay at night, you will feel that as if you are in Marina Bay in Singapore (almost). But that is not the end of the story, after dinner, we went to SM MOA and agreed to ride as many rides as we can. And the first one in the list is the - DROP TOWER! Next in the list was her show - Bungee Fun! Then, the Viking Ship. I hate this ride! And the last ride was the Wowowee Wheels! Thank you Genine for all your help sa travels ko. Good Luck and Best Wishes sa Dubai! Going to Sagada has become a yearly activity. It all started in 2010 when I first stepped in Sagada and I was awed by its serenity, beauty and grandeur. From 2010 to 2013, I always go to Sagada during Christmas season. And the last trip was my first summer tour of Sagada. There are three options. You can either go to Baguio or go to Banaue. I know for a fact that Floridablanca Bus (not operating) is the one servicing this route. But I have no idea on their schedules. I have never tried the Banaue route. I tried once the route from Banaue to Manila but not Manila to Banaue. Board a bus going to Baguio either from Cubao or from Sta. Cruz, Manila. The buses available are Genesis, Victory Liner, Dagupan Bus Liner, Five Star or Philippine Rabbit. It is a lot better to travel at night. The last trip in Sta. Cruz, Manila is 8:30 pm and the first trip is 11:00 pm. I usually board the 11 pm trip of Genesis to Baguio. You can also board the 10 pm trip of Dagupan or Victory in Cubao (better to call them or make reservation). The fare from Manila to Baguio is P445. After 6-7 hours of travel, you will reach Baguio. Then, from the bus terminal, flag down a taxi going to Dangwa or bus terminal to Sagada. The fare is not more than P50 and travel time is less than 10 minutes depending on the traffic. Tip - The best schedule is to have the 6:30 am trip. But you have to arrive early at the bus terminal. During peak season or long weekends (November - January) , the queue for the ticket is really long. Travel time to Sagada is 5-6 hours. Fare is P220. The first stop is in Sayangangan, Atok, Benguet after 2 hours of travel. Next stop is the small market and you are just 2 hours away from Sagada. Then, the bus will cross a small wooden bridge and you are just 1 hour away from Sagada. Coda Lines is the only company that gives you a direct trip from Quezon City to Sagada. Before I continue with this blog, let me first share to you my other Sagada blogs. Regarding accommodations, tours and guides, you can view them in the link - Everything About Sagada. I arrived in Sagada 12:30 pm that day. I immediately went to my accommodation. It is actually a homestay and the fee is only P250/day at Karen Galas' homestay - 0907-771-4431. This is where I stay whenever I am in Sagada. Before, I use to stay at Tita Mary's Lodge but it is very difficult to reserve and it feels home in Ate Karen's homestay. The trek to the homestay is 15-20 minutes. I rested and fell asleep and was awakened by a rain. Good thing it stopped and I trekked my way to Lake Danum. The trek to Danum Lake from the town is more or less 4 kilometers or 30-40 minutes of ascending walk. Along the way, I passed by the Sagada Pottery. There is actually a Sagada Town Tour comprising of the Sugong Hanging Coffins, Church of St. Mary, Sagada Museum, Sagada Pottery, Sagada Weaving/Looming, Lake Danum and sunset viewing. But I did not join the tour. The Sagada Pottery is just a 10 minute walk from where I was staying. From the town, it would take you 25 minutes. In my five years of travel in Sagada, that was the first time I was given the chance to see and experience the pottery. Good thing there were also tourists that day and I just went inside without being invited. Part of the tour is the history of pottery in Sagada and the process of making a pot. My first time to see the actual making of pottery was in Vigan and the second time was in Vietnam. But the process still amazes me. The tour includes a light snack but I was not officially part of the tour and I did not get one. The pot making demonstration amounted to P100. While I was inside the pottery, it rained anew and I waited for the rain to stop. Well, it did not stop but I continued my way to Danum Lake. It was a gamble that I had to make that day. Usually, whenever it rains, it follows that there will be no sunset. 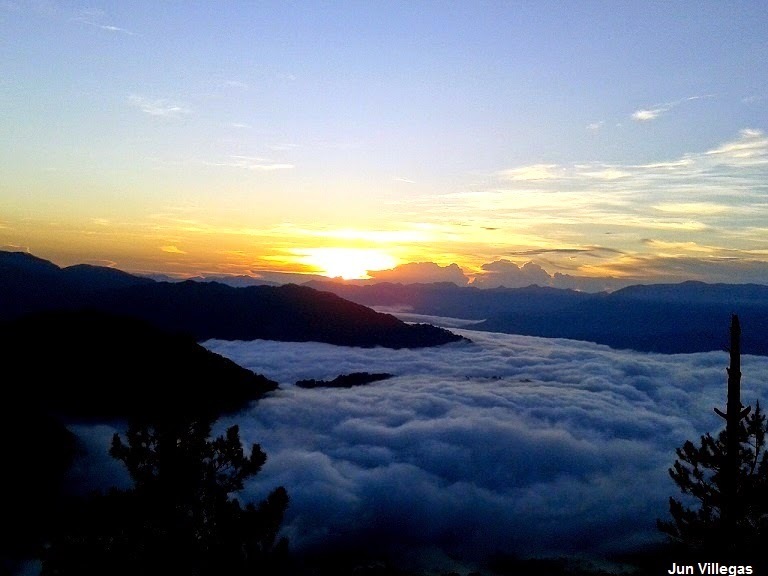 But I was persistent and eager that day to have the summer sunset in Sagada. And after 15 minutes of walking from Sagada Pottery, I arrived at the lake. It was past 5 pm and I was eager to see the sunset at the lake. I was told by the locals that I had to climb the hill to have the best spot of the sunset and I did ascended. And I was able to get the best spot and the best sunset for the day. After the sunset, I went back to the town and took my dinner. There are four things that I had to do in Sagada in that trip, sunset in Danum Lake, sunrise in Kiltepan, buy in the Saturday market and buy ornamental plants. Day 2 is sunrise viewing in Kiltepan View. The ideal time is to be at the site 5 am so that you can witness the sunrise as it unfolds. Ride to Mt. Kiltepan and Danum Lake - Victor 0948-384-3378. The rent for the vehicle is P500 and I shared it with a foreigner and paid only P250. Good thing I was on the site at exactly 5 am and I awaited the sunrise as it unfolds. After a few minutes, it was coming out. And there we have it, the sunrise! After the sunrise, I went back to the town. And the scenery was really BREATHTAKING! Last part of the trip was the souvenir shopping, I was able to buy northface and columbia jackets and the plants that I needed. After the shopping, I boarded the bus back to Baguio. The first trip is 5 am, second is 7 am, third trip is 8 am and the last trip is 1 pm. Register at the Municipal Tourist Information Center and pay PhP35.00 for the environmental fee. This will be your personal ticket to all the destinations. Engage the services of local guides. Never engage the services of children. Always get a guide for all your tours. Last Holy Week (2014), we were in El Nido, Palawan and this May after several choices of destination (Anawangin, Baler, Matnog, Legazpi), we ended up in Panguil, Laguna. 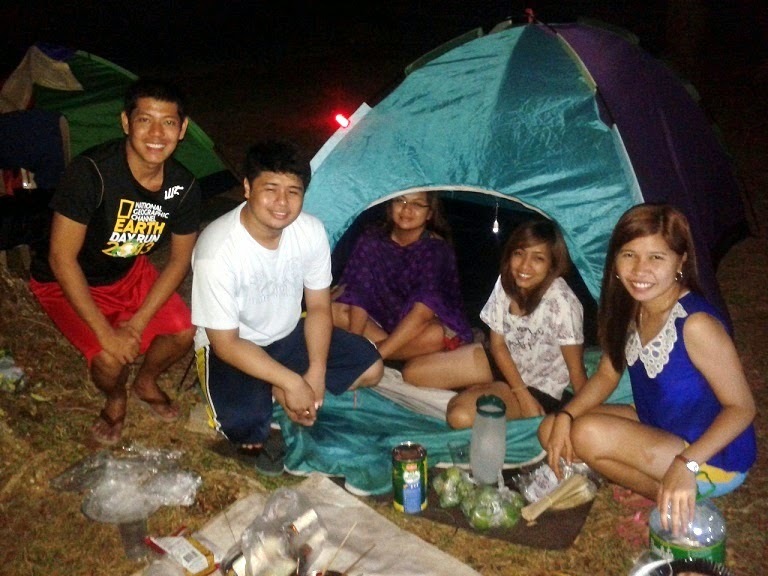 For a change, we tried camping. Only Jen, MJ, Rico, Nikko, Glaiza, Vangie (not in the picture) and I joined this adventure. Lester just arrived from Malaysia that day. Jonas was busy in his business. Dave is in New Zealand. And the rest of the packers are just busy in their respective careers either as a mother or as a girlfriend). Anyway, meeting place was in SM Calamba 7am. But Glaiza arrived 8:15. From Buendia, Manila or Cubao, board a bus (DLTB or Greenstar) going to Sta. Cruz, Laguna. Travel time from Manila to Sta. Cruz, Laguna is 2-3 hours depending on the traffic in Los Banos, Laguna. Fare is P140 from Buendia. From Calamba, fare is P61 only (in some buses P80) and travel time is only 1 hour and 20 minutes. Reaching the capital of Laguna, board a jeep going to Siniloan. Fare is P35 only and travel time is 50 minutes. Then, once you have reached the town of Pangil, board a tricycle to Panguil River Eco-Park and the fare is only P10/pax. Travel time is less than 5 minutes from the town. If you are from Rizal, you can go to Antipolo City and then board a jeep going to Siniloan and then, Siniloan to Pangil, Laguna. It is better to buy the supplies in Sta. Cruz than in Pangil. Once you are at the Eco-Park (0915-379-5866/0932-372-9861), you have to pay P75 for the entrance and P100 for overnight stay. But we paid P120 that day since we arrived 2 pm and will check out the following day at 12 pm. Overnight stay is 6 pm to 6 am only. Rental fee for the tent is P300. We rented 4 tents that day and much to our dismay, we waited for the availability of our reserved tents. After fixing our respective tents, we started our Ambon-Ambon Falls trek. We paid another P75 for this adventure. We had to trek from the base camp up to the site of the falls. We had to board the bamboo raft for three times before reaching the spot. But some of us decided to swim in the river. After almost an hour, we reached Ambon-Ambon Falls. And this is Ambon-Ambon Falls!!!! It was F U N! We stayed for more than an hour and took several souvenir pictures including this one! Then, we decided to go back and relived our bamboo rafting adventure! Another selfie onboard the boat won't hurt! Reaching the camp, we cooked our dinner. Hotdogs and chicken adobo. Dinner time, we ate and afterwards we enjoyed our drinking spree of 2 bottles of Alfonso Light. Then, exchanged jokes and played our syllable game. We missed Lester and Jonas playing this game, they are the experts on this game. I did not sleep much that night either because it was hot or because of the sound of videoke that night and I woke up 4 am. I prepared the hot water for the coffee and bulalo cup noodles for our breakfast. Past 7 am, we started our trek to Hidden Falls or Buntot Palos Falls. We hired Mang Del (0910-500-1728) to be our guide for that day for P500. Mang Del was my guide a few months ago when I visited the Eco-Park, He was also our guide at the Ambon-Ambon Falls. He is kind, accommodating and courteous. Normally, the trek is good for 2 hours. And the ascending trek is good for 45 minutes and the rest is simple trekking. Halfway through, we passed by a natural source of water and quenched our thirst. And after almost 2 hours of walking, we reached our destination - Hidden Falls or Buntot Palos Falls! We stayed at the base of the falls for 1.5 hours and enjoyed the water and the scenery! Afterwards, Rico and I decided to go ahead and ended up on a different trail. We arrived instead at Barangay Niyogan and reached the camp ahead of time. Worthy of mentioning are Jayson. Dave, Jonas, Lester and Peng! I miss you guys! Till our next adventure. My 40th birthday first in October then, Mt. Pulag on December. If you want to find a place to eat in Pangil, please do drop by at this eatery - Pangilenean. It is situated just beside the church of Pangil and the terminal of jeep and tricycle. You will love their halo-halo!